For thousands of years, quilting has brought people together. Spanning centuries and cultures, groups of people have gathered to make quilts to stay warm, to preserve their history and to decorate their homes. It is an important part of our American heritage. My grandmother saved empty, brightly colored feed sacks, as did her friends, and they gathered together on a regular basis to turn those used feed sacks into quilts. But what, you might wonder, does quilting have to do with the Pierce County Medical Examiner’s Office? 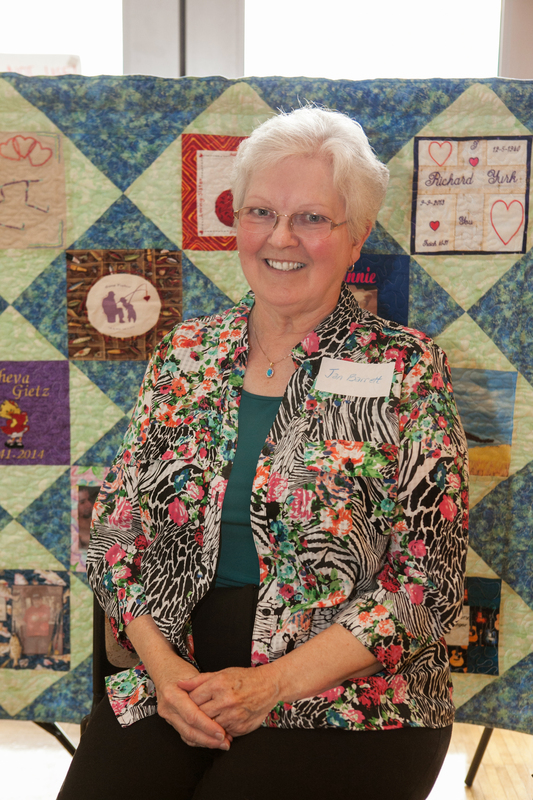 Jan is a long-time resident of Puyallup and a quilter. She has had poor eyesight since childhood, but, as an adult, she was facing progressive vision loss that would eventually lead to blindness. She found herself unable to drive or read, and was no longer able to see well enough to sew. She had already had several eye surgeries, and her only remaining option was a cornea transplant. In February 2015, Jan received new corneas, the gift of a family who lost a loved one but who wanted that loved one to live on in the gift of sight. With her sight restored, Jan is once again active in her community. She is involved with a Veterans group, and a philanthropic organization that focuses on education for women. She is able to take care of her husband, who has a progressive health issue. She is also able to quilt again. SightLife is an international eye bank based in Seattle. They recover corneas from donors, process those corneas, and facilitate transplant. They coordinated Jan’s transplant, as they have for many people in Pierce County and throughout the world. SightLife offers the family of each donor an opportunity to contribute a square to a quilt to commemorate the life of that donor, and to honor their decision to donate sight. Using her newly restored sight, Jan volunteered to make one of those quilts. That quilt now hangs in the Pierce County Medical Examiner’s Office, on loan from SightLife in recognition of the role that we play in donation. There is a strong mandate for donation in Washington. Almost 86% of Washington drivers have chosen to be donors. There are state laws that require cooperation between medical examiners and donor agencies. There are also complex rules published by the U.S. Food and Drug Administration that regulate every aspect of cornea and tissue donation, including relatively short periods of time after death when corneas can be recovered. With some exceptions, such as patients admitted to a hospital for a natural disease, the Medical Examiner’s Office is notified of all deaths in Pierce County. It is the only real-time registry of such deaths. It is our job to determine which of those deaths requires investigation, and to perform that investigation. Our investigative tools include scene visits, medical record and other database searches, interviews with family and law enforcement officers, and—ultimately, some sort of examination, up to and including an autopsy. Yet therein lies a conflict. We have a statutory and ethical obligation to cooperate with recovery agencies, but if we perform a full autopsy without consideration of donation, it can lead to compromise in the quality of the recovered tissue. There are other conflicts as well—for example, both groups are operating under significant time constraints. Out of a series of discussions over a period of months, came a ground-breaking idea—cooperation. By working together in the same facility, each group can meet its goals without compromise, and no Pierce County family is denied the opportunity to donate. If you come into the Medical Examiner’s Office today, you will find a beautiful quilt, but you will also find a wonderful cooperative arrangement between partner agencies. We share information, space, ideas, and goals. We work together to make sure the intent of every Pierce County citizen who wishes to donate life is carried out. Death investigation is not compromised, and sometimes happens a little faster than it used to; nor is there any compromise to the quality of donated tissue. In 2016, this cooperative program yielded 357 cornea donors, with a very high percentage suitable for transplant. There were also 128 tissue donors, resulting in life-saving or life-improving grafts for almost 16,000 recipients. Many people are seeing again, walking again, recovering from burns or other injuries as a direct result of the work of the Pierce County Medical Examiner’s Office. There are many family members of donors who can take comfort in knowing their loved one made a final gift that changed lives. The staff of the Medical Examiner’s Office have difficult jobs. When we come to work, we are focused on death all day, every day. It is important work, because unbiased death investigation strengthens society, but it is still hard. Thanks to our partnerships with SightLife and two tissue recovery agencies, we have another rewarding part of our mission—helping to fulfill the final wishes of those Pierce County citizens or their families who wish to donate the gift of life. Jan’s quilt reminds us of that important role. The squares of that quilt, representing individual donors, have been sewn together into a fabric that unifies those donors into a powerful symbol of hope. I am proud of the staff of the Medical Examiner’s Office for their roles in these life-changing partnerships, and proud to be one of them!